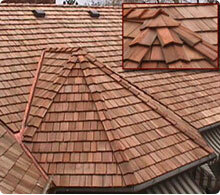 Above All Roofing is your # 1 choice for Split Cedar Shake Roof installation. Wood shingles and shakes have long been favored as roofing materials because they are attractive, durable, and provide good insulation from heat and cold. Cedar shakes combine a traditional look with reliable, modern performance. They are a great choice for historic homes or homes in new developments with high appearance-standards. Also, cedar shakes are an environmentally friendly option for consumers. The life expectancy of cedar shakes is up to 30 years, if quality materials are used. New technology in Split Cedar Shake allows this beautiful product to be durable and fire retardant as well. This type of smooth-sawn architecturally uniform cedar shingle is preferred for its natural and tailored appearance and is used on traditional and modern residential and non-residential structures. 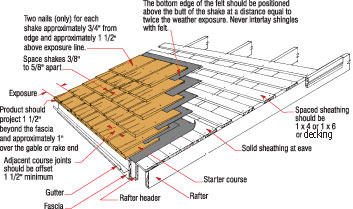 Permanent Fire protection is provided by pressure impregnating fire retardant polymers into the innermost cells of cedar shakes for class C or B shake and shingle roof systems and class A shake roof systems.